1st Battery (or Battery A): At Murfreesboro with two 6-pdr field guns, two 3-inch Ordnance Rifles, and two 3.80-inch James Rifles. Captain Theodore S. Thomasson remained in command. And the battery remained at Murfreesboro as unassigned artillery in the Army of the Cumberland. 2nd Battery (or Battery B): No return. Captain John M. Hewett’s battery detached from Second Division, Fourteenth Corps to support the 1st Michigan Engineers and Mechanics at Elk River Bridge, Tennessee. 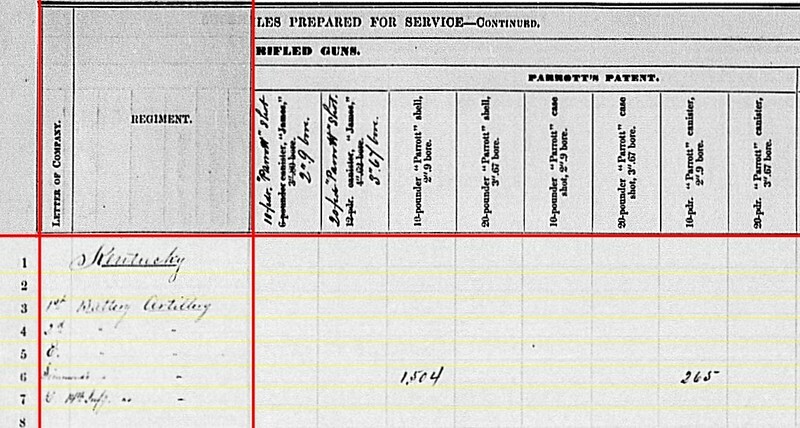 An army return from late September 1863 indicated four artillery pieces were at the bridge, presumably all Hewett’s. 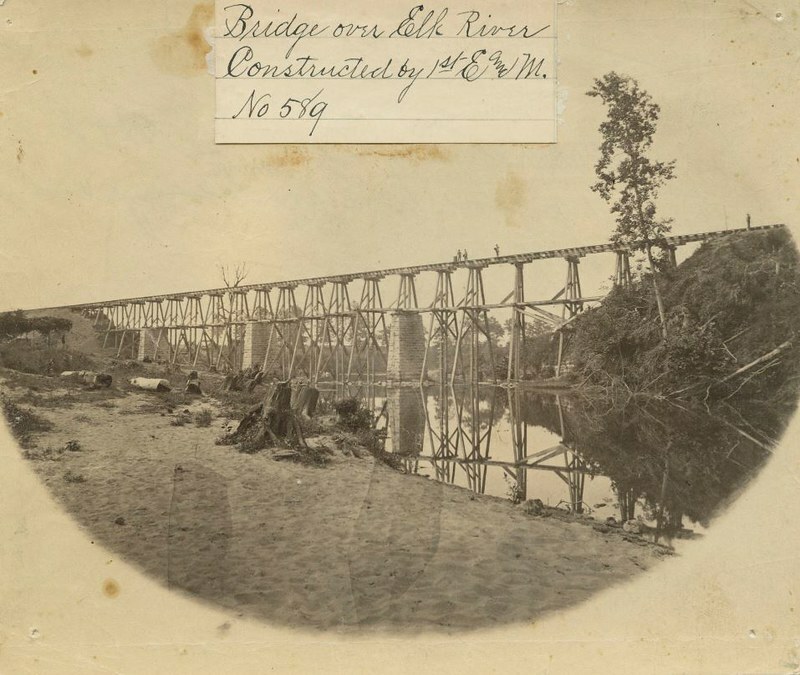 A wartime photo shows this bridge rivaled the famous “cornstalks and beanpoles” Potomac Creek Bridge of Virginia. 3rd Battery (or Battery C): Not listed. While organizing, earlier in the spring, the battery was captured (and paroled) when Confederates raided Lebanon, Kentucky, thus setting things back a bit. Formally, the battery did not muster until September 1863. The battery remained at Louisville, Kentucky through the fall. Captain John W. Neville in command, the battery was assigned to First Division, Twenty-Third Corps. Battery E: At Camp Nelson, Kentucky, with no artillery. Captain John J. Hawes commanded this brand new battery, formally mustered on October 6, 1863. Simmonds’ Independent Battery, also 1st Kentucky Independent Battery: No location given, but with six 10-pdr Parrotts. This was Captain Seth J. Simmonds’ battery and was stationed at Gauley Bridge, West Virginia through the late summer. The battery was assigned to Scammon’s Division, Department of West Virginia. In late September the battery moved to Camp Toland, Charleston, West Virginia. The battery remained active, supporting various scouting operations and expeditions in the department. Company G(? 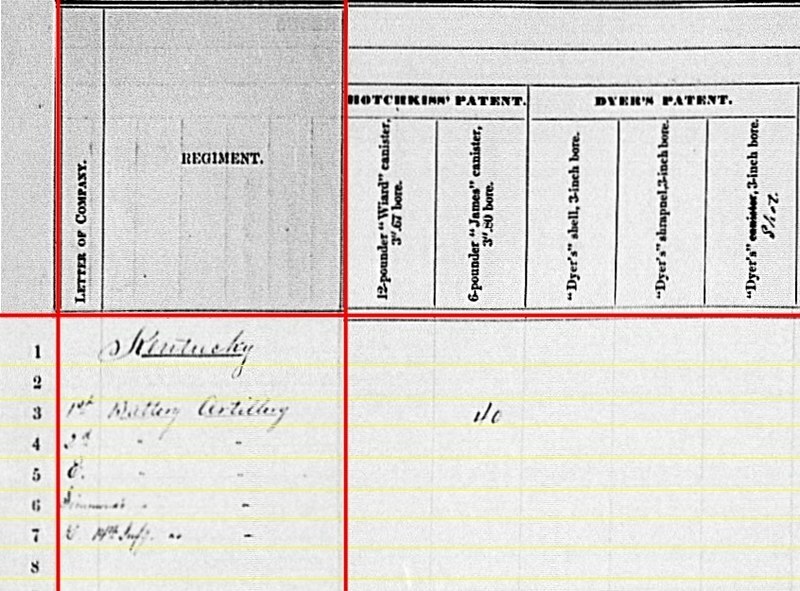 ), 14th Kentucky Infantry: At Louisa, Kentucky, with four 6-pdr field guns, two 12-pdr field howitzers, and two 3.80-inch James Rifles… yes, quite a battery in that infantry regiment! Colonel George W. Gallup’s regiment was posted to Louisa as part of the Twenty-Third Corps. 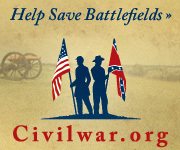 Remaining behind during the Knoxville Campaign, the regiment formed into the District of Eastern Kentucky. 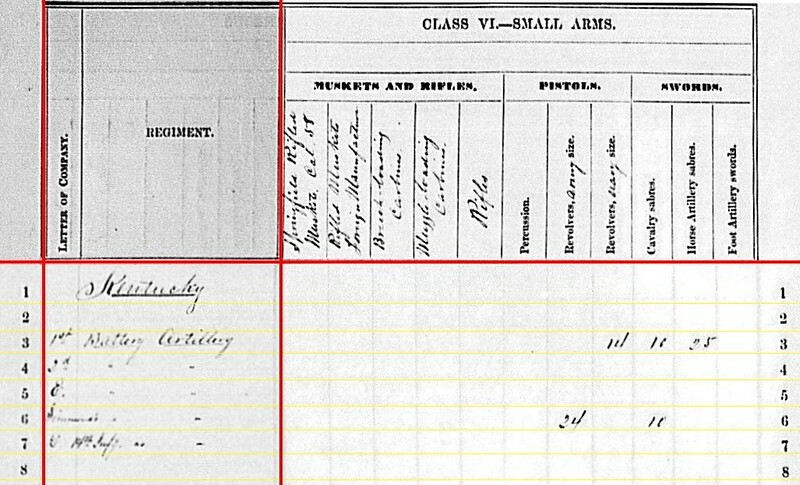 Though I don’t have any other details as to this “section” of artillery within the regiment. Though we still have a mix, and mess, of designations, the clerks had made progress documenting the Kentucky batteries. 1st Battery: 320 shot, 180 case, and 111 canister for 6-pdr field guns. 14th Infantry: 532 shot, 358 case, and 295 canister for 6-pdr field guns; 56 case and 11 canister for 12-pdr field howitzers. 1st Battery: 75 canister, 80 percussion shell, 80 fuse shell, and 160 bullet shell for 3-inch rifles. 1st Battery: 40 canister for 3.80-inch James rifles. 1st Battery: 12 shot and 66 shell for 3.80-inch James Rifles. 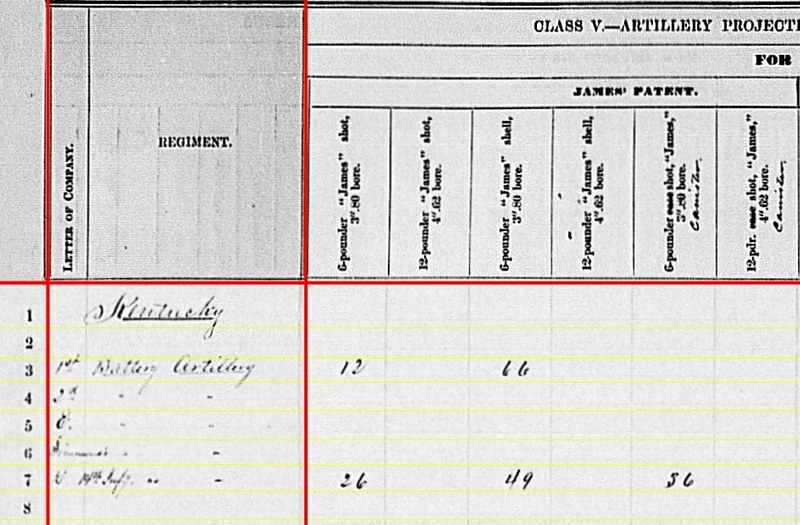 14th Infantry: 26 shot, 49 shell, and 36 canister for James Rifles. Simmonds’ Battery: 1504 shell and 265 canister for 10-pdr Parrotts. Simmonds’ Battery reported a large quantity of shells on hand in previous quarters. So this is no quarterly aberration. 1st Battery: 250 Schenkl shell for 3.80-inch James Rifles. Simmonds’ Battery: 69 Schenkl shell for 10-pdr Parrott. 1st Battery: 110 canister for 3.80-inch rifles. 1st Battery: Fourteen Navy revolvers, ten cavalry sabers, and twenty-five horse artillery sabers. Simmonds’ Battery: Twenty-four Army revolvers and ten cavalry sabers. Next up, we turn to the Kansas batteries… you see, while the clerks were struggling with their accounting of Kentucky’s cannon, they were hard pressed to keep things alphabetical!